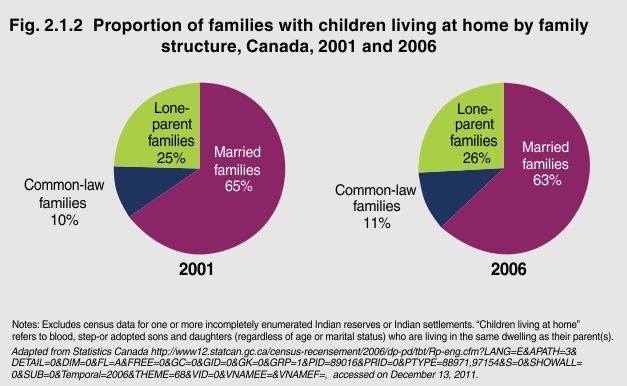 In 2006, the majority of families with children living at home were married families (63%), while 26% were lone-parent families and 11% were common-law families. Census data from 2001 and 2006 suggest that the structure of families with children is changing. The proportion of lone-parent and common-law families increased while married families decreased. We must be aware that family structures are fluid. The relative stability portrayed in these charts can be misleading if readers fail to note that children’s experiences of family structure may have been or will be different than at the time of the Census.